Maruti Suzuki has just launched the much awaited Ignis in the Indian market. It was unveiled first at the 2016 New Delhi Auto Expo in February last year. The Indo-Japanese automaker has termed the car as the ‘premium urban compact’. It has been designed and built targeting the young-age urban customers of the country, who seek a blend of stylish design, value for money, useful and attractive features, and that too at an affordable pricing. Priced between Rs. 4.59 lakh and Rs. 7.48 lakh (ex-showroom, New Delhi), the Maruti Suzuki Ignis tries to fulfill all these requirements. The Indian customers are showing more and more interest towards buying upmarket cars rather than mundane basic models. Maruti Suzuki clearly says that the Ignis has been designed to cater those customers. The automaker will sell the Ignis through its Nexa premium dealership, which also sells the Baleno premium hatchback and the S-Cross crossover. Hyundai being the second biggest automaker in the country offers several attractive and very popular cars in the domestic market. One of them is the Grand i10 that has been an upmarket looking budget friendly hatchback on offer for quite some time. This car is priced between Rs. 4.91 lakh and Rs. 6.99 lakh (ex-showroom, New Delhi). This is very popular to those who want a car with impressive performance, stylish appearance at an affordable pricing. Maruti Suzuki Ignis has been designed to catch anyone’s attention at the first glance. This urban compact hatchback gets projector headlamps with integrated LED daytime running lights, sleek chrome trim at the front grille. The front grille and headlamps have been designed in such way that gives them a single unit like look. The Suzuki logo sits at the centre of the blackened grille. The front bumper looks muscular and comes with chrome garnishing around the fog lamps, enhancing its appeal further. Along with these and the clam-shell bonnet, the entire front fascia grabs attention very easily. At the side profile, the Maruti Suzuki Ignis features a muscular look with the 18-inch sporty alloy wheels, flared wheel arches and the sleek black side cladding. Apart from that, it gets blackened-out A and B pillars and a bit boxy appearance as well. There is a triple slat at the thick C pillar of the car that gives it an unique look. Rear fascia of the Maruti Suzuki Ignis received compact taillights, a muscular bumper with thick and wide black insert and there is a rear windshield wiper as well. Altogether, the design of the Ignis has been well crafted and well executed. 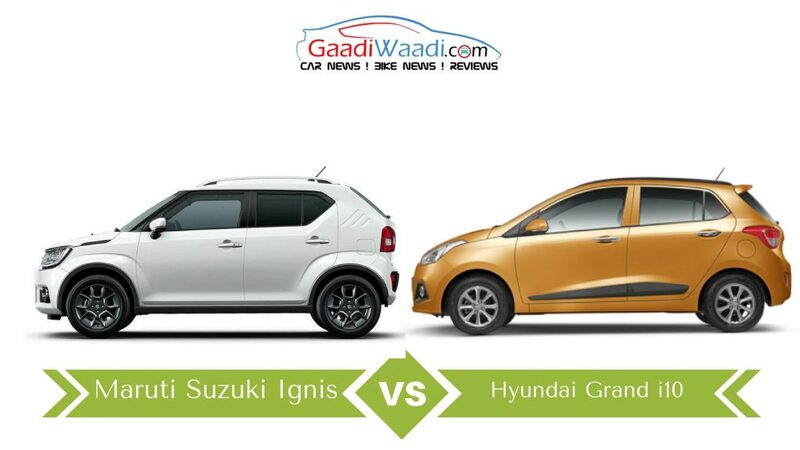 Hyundai Grand i10 on the other hand also bears an attractive look, but compared to the Ignis it looks bit dated. It comes with sharp laid back headlamps, but no LED daytime running lights are on offer. Apart from that, the large hexagonal front air intake enhances the hatchback’s bold look at the front. The headlamps are joined with a sleek horizontal chrome trim. Speaking about the front bumper, Grand i10 sports a muscular bumper and the fog lamps come with black surrounding around them. Unlike the Maruti Suzuki Ignis, the Hyundai Grand i10 gets a sloping bonnet. The entire front fascia of the latter model is claimed to be helping the car with aerodynamic efficiency and no wonder it looks pretty stylish indeed. At the side profile, the Grand i10 bears turn indicator integrated ORVMs, sporty alloy wheels, black plastic cladding at the lower side body, blackened B pillar, integrated black roof rails and chrome finished door handles. Rear of the Grand i10 appears with wrap around compact taillights, an integrated roof spoiler, rear windscreen wiper and the bumper looks well sculpted. Overall, the Hyundai Grand i10 comes with well designed and well engineered appearance that is pretty impressive and practical. But with its more contemporary design, Ignis wins the bet. A facelift based on current Euro-spec i10 will be introduced soon and that might close the gap in terms of looks and features. Dimensionally, Maruti Suzuki Ignis measures 3,700 mm in length, 1,690 mm in width and 1,595 mm in height. It also has a wheelbase of 2,435 mm and the 180 mm of ground clearance helps the car to tackle the potholes easily. The five-seater car offers a 260-litre capacity bootspace as well that gives generous room for luggage. The Hyundai Grand i10 on the other hand measures 3,765 mm in length, 1,660 mm in width, 1,520 mm in height and it comes with a wheelbase of 2,425 mm. It has a ground clearance of 165 mm that is much lower than the Ignis and the hatchback offers a bootspace of 256-litre. Therefore the Ignis is 65 mm smaller in length, 30 mm wider and 75 mm taller than the Grand i10. Also, it offers 10 mm of extra wheelbase compared to the Hyundai hatchback. Along with the 15 mm of extra round clearance Ignis also gets 4-litre of extra luggage space at rear. This means the Ignis comes with more space for the occupants ensuring a comfortable journey experience compared to the Grand i10. 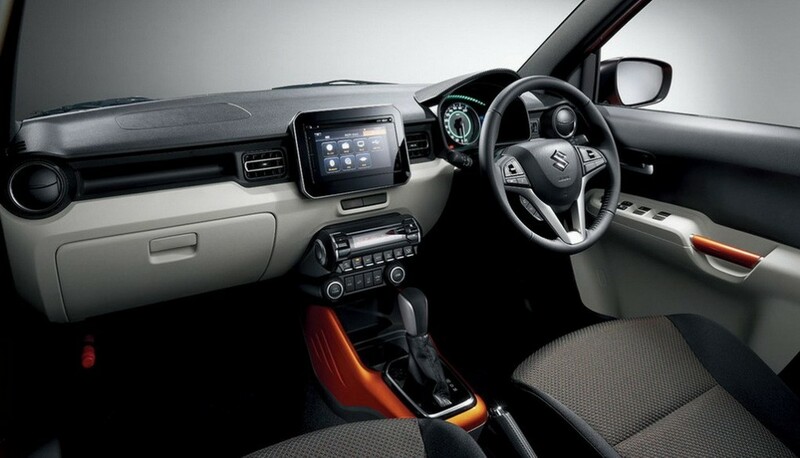 Inside the cabin, Maruti Suzuki Ignis is truly upmarket with the design and features on offer at such price point. It gets a multi-function steering wheel, an interesting looking instrument cluster with both analog dials and digital display. The dual-tone dashboard, carbon-fibre rim around the AC vents enhance the appeal further. 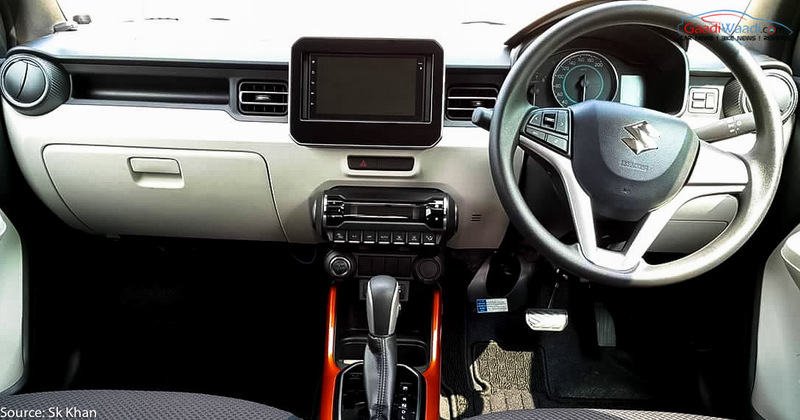 The centre of attraction inside the cabin is the tab-like touchscreen infotainment system that sits at the centre console and comes with Apple CarPlay and SmartPlay. Also the Ignis gets an audio system with AUX-in, Bluetooth and USB connectivity and a push start button. The seat and upholstery materials are quite impressive and the cabin offers generous headroom and legroom for the rear occupants, ensuring comfort. The rear seats can be adjusted to enhance the leg-space further. It looks like Maruti Suzuki has left no stones unturned while designing the Ignis. The Hyundai Grand i10’s cabin looks very practical and attractive. But compared to the Ignis, it looks Spartan. The premiumness like he Ignis is not there inside the Grand i10 cabin. The design, seat and upholstery materials are not that upmarket like Ignis. 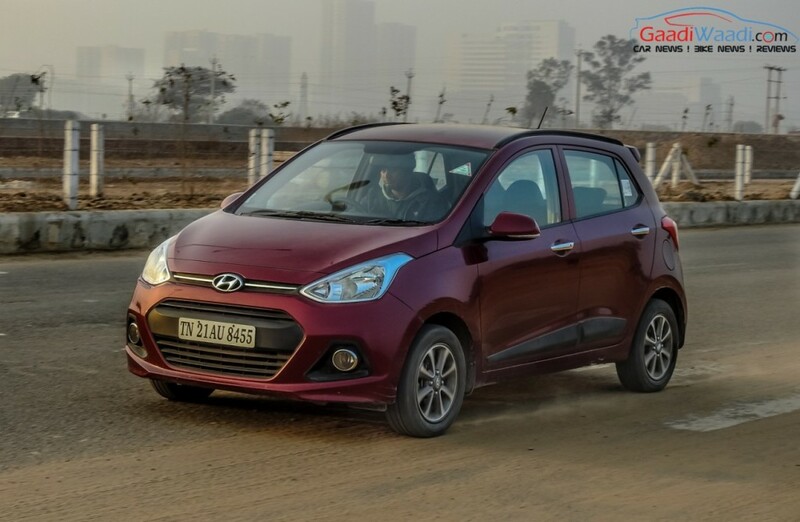 The Grand i10 sports a three-spoke multi-function steering wheel, analog dials and digital MID consisting instrument cluster and a 2-DIN audio system. The special edition of the car gets a 6.2-inch touchscreen infotainment system that is available only in the top variants. This certainly gives the Ignis an edge as a touchscreen infotainment system is in demands for the modern customers. 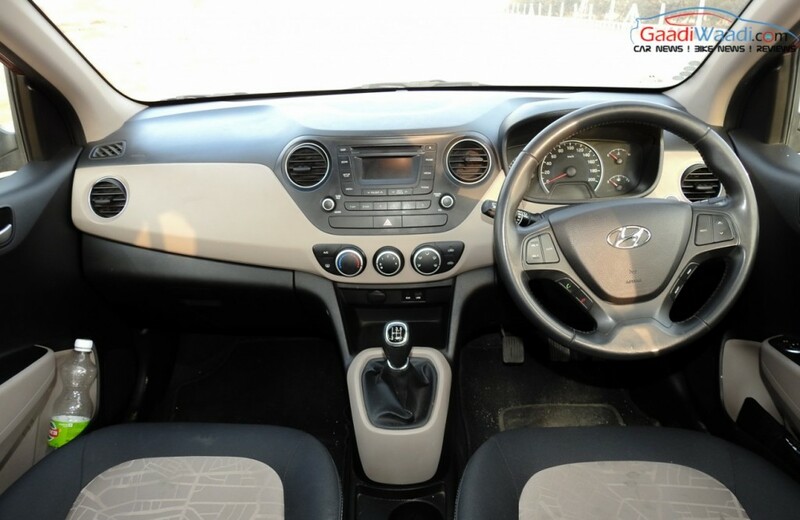 Apart from that, the Grand i10 gets dual-tone dashboard, circular AC vents, rear AC vents etc. This car also features cooled glove box, smart push start/stop button and height adjustable driver seat. Both the Maruti Suzuki Ignis and the Hyundai Grand i10 are available in petrol and diesel powertrain options. The Ignis gets a 1.2-litre four-cylinder VVT petrol engine capable to churn out 84 PS of peak power at 6,000 rpm and 113 Nm of peak torque at 4,200 rpm. The engine is available with both 5-speed manual gearbox and an AMT as well. This petrol engine returns impressive fuel efficiency of 20.89 kmpl. The diesel engine onboard the Ignis is a 1.3-litre four-cylinder DDiS unit that is capable to kick out 75 PS of peak power at 4,000 rpm and 190 Nm of peak torque at 2,000 rpm. The engine is available with both 5-speed manual gearbox and an AMT as well and it delivers a fuel efficiency of 26.80 kmpl. Speaking about the Hyundai Grand i10, the hatchback gets a 1.2-litre Kappa dual VTVT petrol engine under the hood that is paired with a 5-speed manual gearbox and pumps out 83 PS of peak power at 6,000 rpm and 114 Nm of peak torque at 4,000 rpm. There is an automatic transmission offer s ell, but that is available with the magna and Asta (O) variants only. The manual variant returns a fuel efficiency of 18.9 kmpl, while the automatic variant delivers 16.95 kmpl. The 1.1-litre second generation U2 diesel engine is paired with a 5-speed manual gearbox and churns out 71 PS of peak power at 4,000 rpm and 160 Nm of peak torque between 1,500 rpm and 2,750 rpm. Maruti Suzuki Ignis comes with advanced safety features like dual front airbags. Euro NCAP tested the car and there it was equipped with frontal airbags for side head, chest and pelvis protection s well. Also, Ignis is claimed to be built on a tough structure called Suzuki TECT that will minimize the impact. It also gets ABS with EBD, rear parking sensor, rear parking camera for top variant, seatbelt reminder, seatbelt pre-tensioner and force limiter, rear defogger, speed sensing auto door lock, engine immobilizer and pedestrian protection as well. Hyundai Grand i10 also comes with several safety features to make the ride safer. It gets dual front airbags, ABS, and reverse parking sensor. The body structure is also rigid and enhances protection. Hyundai has used anti-corrosive steel in making this structure. Therefore, both the Ignis and Grand i10 come with decent safety features. But the Maruti Suzuki vehicles stays bit ahead than its South Korean rival. Pricing wise both the cars appear very competitive against each other. The Maruti Suzuki Ignis is priced between Rs. 4.59 lakh and Rs. 7.48 lakh (ex-showroom, New Delhi), while the Hyundai Grand i10 is available with price tags between Rs. 4.91 lakh and Rs. 6.99 lakh (ex-showroom, New Delhi). The base variant of Ignis comes lower priced than the Grand i10, while the top variant is little extra priced than the Korean hatchback’s top variant. 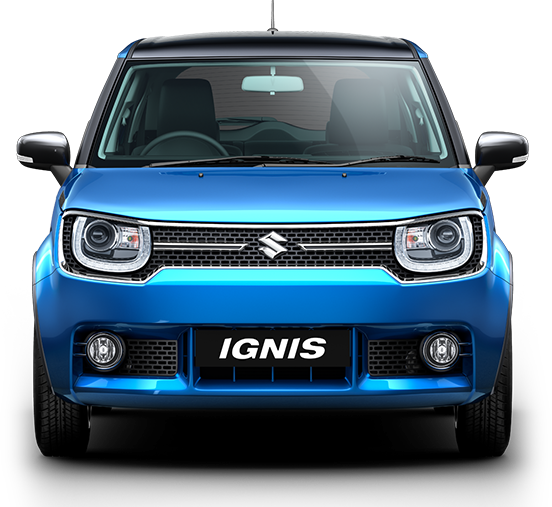 But with such attractive features on offer, the Ignis is really a good buy for customers. 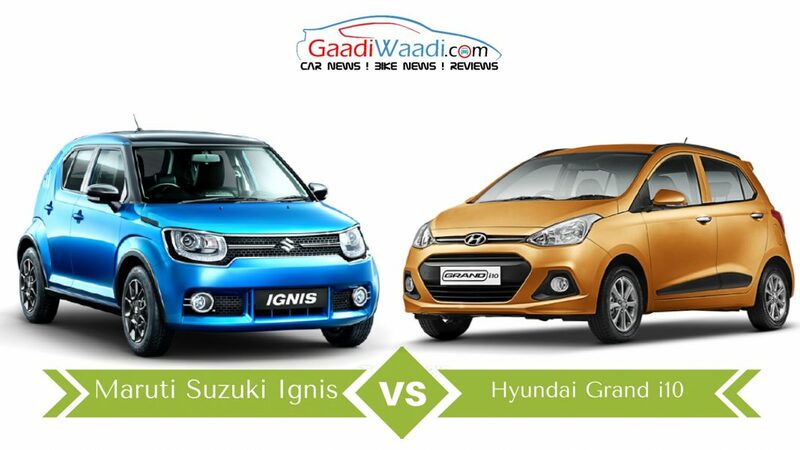 Both the Maruti Suzuki Ignis and the Hyundai Grand i10 are very attractive in terms of design and features. The Ignis however comes with more impressive styling and more features compared to the Grand i10. The interior of the Maruti Suzuki vehicle boasts the design and features that will surely grab attention of the young urban customers. On powertrain front, both the cars are very well quipped. While Maruti Suzuki offers an AMT at lower price point with Ignis, the Hyundai offers a fully automatic transmission only on petrol. Power and torque outputs of both the cars are also identical on both the petrol and diesel front. 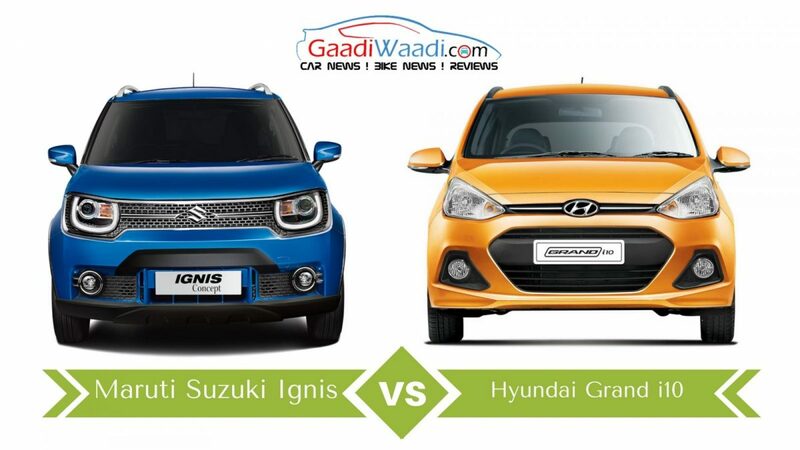 Speaking about fuel efficiency, Ignis betters the Grand i10 with superior figures. 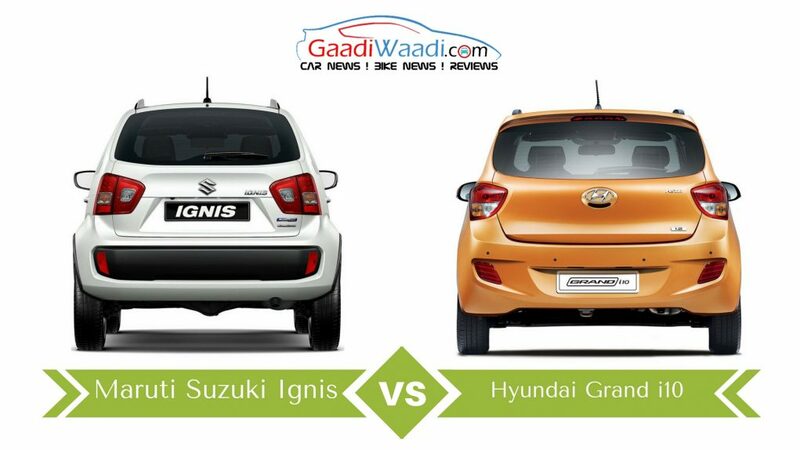 On safety front, Ignis is better equipped than the Grand i10 as well. Pricing wise, both the cars are very closely competitive. But with so many things on offer and considering the brand name and brand value, Maruti Suzuki Ignis is our choice between these two cars.